With birthdays unable to be celebrated at hostels, foodys serves as a prime location to do so. Along with its open space and high ceilings, it’s also a great location to hangout as couples, groups of friends, and even hosting club gatherings. Along with this, foodys acts a practice ground for VITs very own dance teams, and if you are lucky, you can catch a quick sneak peak of what’s going to come. Apart from rankings, VIT is known for its huge club collection, ranging from technical/management to trekking. The sheer number of clubs at VIT make it impossible even to know all the names, but if used these opportunities wisely, it would be used to help grow your network and boost your resume. VIT is known for its two major fests: GraVITas and Riviera. These are the pinnacle moments of any college experience, seeing your favorite celebrities, eating from the food stalls, and hanging out with your friends. GraVITas is a technical fest which focuses on user developmental skills, while Riviera builds a cultural aspect to VIT. All in all, these fests are what VIT is known for, and we highly urge you get your hands on helping with any club. Tired of mess food? Well you are in luck, as more and more shops are being open around VIT, after seeing the population and culture changing over the past 5 years. Restaurants like Tom's Diner, Thick Shake Factory, and The Haze Café are paving the path for more exotic cuisine around VIT, making sure that all the cravings are met. The people of VIT are what ultimately what makes VIT special: from NRIs traveling across seas mixing with both North and South Indians, VIT serves as a perfect ground for companies to come and test new products, give deals, and even coming down to hire VITians. The green campus helps students relieve their stress and makes the surroundings cooler and habitable. 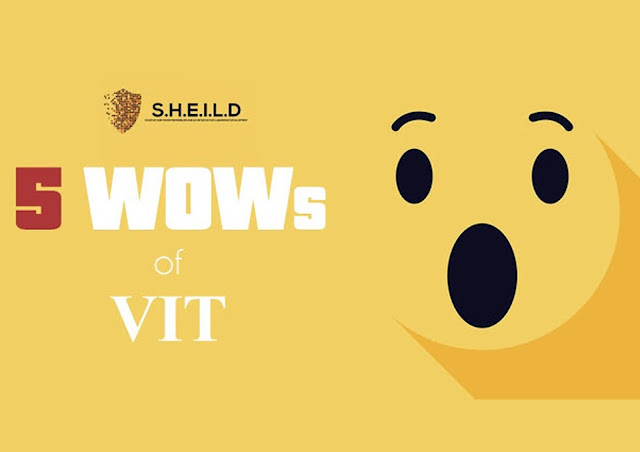 These are the 5 WOW things we found in VIT, what are somethings we missed? Comment down below.